Nepal – ‘the world’s rooftop’. A country in between the two giants India and China and home to the biggest mountains on this earth. After spending more than 3 months in India, we were excited to enter a new country once again. I, personally, was super excited as Nepal had been on my bucket list for a long time, as speaking with world travellers over the years manifested it as a destination for me to aim for. In the end, we trekked less than we initially hoped, ate a lot of Chowmein and Nepali Thalis and fought our way through the most bumpy and dusty roads that I’ve ever seen! Our first ride from the Indian border to Kathmandu was a beautiful but exhausting welcome to the country – the ride, according to Google maps an 8 hour one, in the end took us 12 hours of pure driving time. On a direct ride on the back of a pick-up my group went from enjoying the sun and the refreshing driving winds to stargazing under a cozy blanket at night. Due to our exposed spot, we got our first taste of Nepali mountain roads, bouncing around wildly in the back of our truck. Two years after the horrific earthquake in 2015, Nepal’s infrastructure is yet to recover; some highways remain unpaved and due to this traffic jams occur regularly. Having arrived in Kathmandu, we excitedly, but tiredly, met up again with Ia after her 10 day absence from the group. Our first impression of the city was that it was incredibly dusty due to many roads being unpaved. On the streets, many people wore face masks to protect their health. Also, the impressive Himalayan ranges were not visible to us just yet from here. Exploring the touristy city center, we scouted through shops and got used to the new prices. After settling down with our Couchsurfing hosts and getting used to the city, we went off to meet some of Kathmandu’s amazing NGOs. At Women for Human Rights (WHR) and Seven Women, we got a good glimpse of the problems women in Nepal are facing as both aim to empower Nepali women at a grassroots level. In Nepal, a strong patriarchy and child marriages are still huge issues together with the chaotic and male-dominated political landscape. We also got to know that female widows in Nepal are severely discriminated and expected by society to self-restrict themselves heavily after the death of their husband. In the Tibetan Welfare center, we learned more about another discriminated minority living in Nepal – the Tibetan refugees. Despite being a direct neighbour and the first country most Tibetans flee to, the Nepali government decided 20 years ago that it would no longer recognize Tibetans as refugees. That means that all Tibetans living in Nepal are doing so illegally in the eyes of the Nepali authorities. This makes them unable to travel abroad, own property, start a business or get a driving licence and puts them in a vulnerable situation where they can be harrassed by police and other authorities. Most Tibetans in Nepal were born in the country after their parents fled from Tibet and are therefore officially stateless. After meeting with Kathmandu’s NGOs, we were longing to finally see impressive mountain ranges and to go on trekking adventures. Following another long and dusty hitchhiking trip, we all found each other again in Pokhara, a city famous for its beautiful lakeside and stunning views of the Annapurna range. As Ia would soon need to leave the project once more (this time to activate her Canadian Working Holiday Visa), we decided to go for a short hike up to Dhampus, a mountain village in the Annapurna National Park. Up there, we pitched our tents for the night and woke up to a crystal clear panoramic view of the stunning Annapurna range, including our first eight-thousander with Annapurna I at 8091m. Until late in the afternoon we hung out in this beautiful setting, drawing and playing with a local child that joined us. Finally, our playtime came to an end when the clouds came up signaling that it was time to head back to Pokhara. In an emotional goodbye including an enthusiastically dabbing Dheeraj, we sent Ia off to Kathmandu to catch her plane out of the country. Now, we were for the first time without the driving force and the initiator of the project and started off by reorganizing assignments and responsibilities. Over the next few days, we worked a lot, spoke with Tibetan refugees in a settlement near Pokhara and in the evenings relaxed at Pokhara’s beautiful lakeside or sat around chatting with our incredibly warm host Bishnu. At the same time, we tried to get Murad to join us for our time in Thailand by trying to find ways to convince his father to let him stay with Spicyroad longer. Imagining Murad not being able to accompany us just felt unfair and inspired all of us to brainstorm solutions together. 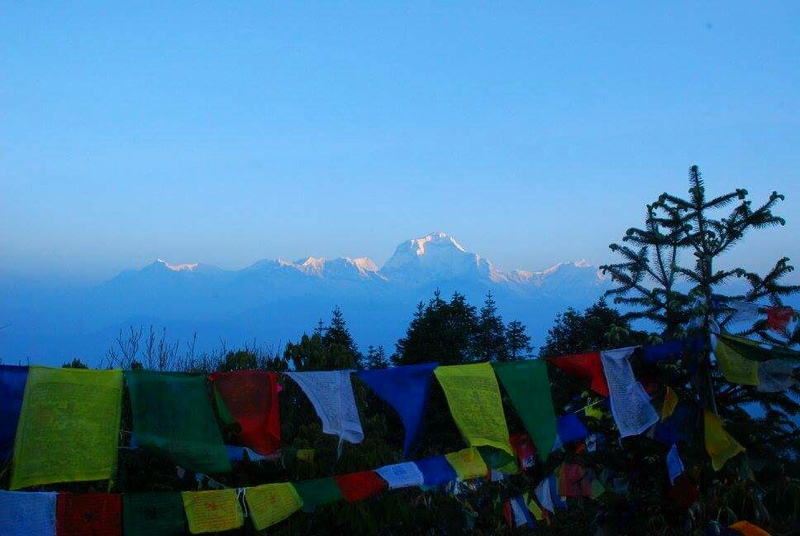 When we first entered Nepal, we had the strong aim to do at least one longer trekking trip in the country. Upon finding out that trekking here demanded quite an expensive fee though, we decided to split up. Nina and Murad went for the 4 day Poonhill trek and hiked through waterfalls, hot springs and mountain villages all while having the enormous mountain panorama in front of them. Dheeraj stayed behind in Pokhara and Nadya, Elena and Yannic went for a little village in the mountains to stay with Bishnu’s cousin Ganesh. There they gained a totally new perspective, seeing the fully independent and sustainable, but also incredibly hard lifestyle of Ganesh’s family. Everything from rice and meat down to salt they produced themselves. It was definitely amazing to see how independent they were in this position. Finally, with a heavy heart we decided to leave Pokhara and head on further towards Barathpur, a city that suffered so much under the earthquake 2 years earlier. On the dusty and bumpy ride, a truck that Nina, Elena and Dheeraj managed to hitch a ride with broke down because of a puncture. It wasn’t until 2am after being stuck for hours in the middle of nowhere that they finally arrived and were welcomed safe and sound by the first group, our absolutely lovely host Susma and her husband’s family. During our time in Barathpur, Susma would feed us the most delicious Thalis ever, making us question if we should ever leave her house at all. Initially, we had planned to go from here to the Chitwan National Park to see jungle and wild animals such as elephants or even tigers, before leaving Nepal and heading towards Darjeeling. What we didn’t consider however were the upcoming elections. The whole time we were in Nepal we already had seen rallies of political parties and pick-ups mounted with big speakers running up and down the streets blasting party programs at full volume. Soon the election would take place. And as Ashis, the brother of Susma’s husband, told us, the borders would be closed and a travel ban would be in effect around the election date – reason enough for all of us to panic! Having had in mind to spend a few more days in Nepal, suddenly everyone needed to leave the next day – except for Yannic, who wasn’t allowed to enter India again yet. As Dheeraj and Nadya would not accompany Spicyroad to South East Asia and Murad’s situation was still very uncertain, it would be an unexpected, big goodbye. In an attempt to handle our feelings, we decided to hold a last emotional meeting. It became one of our most emotional ones after having travelled together for 4 months. The following day, the group without Yannic moved towards the Indian border while Yannic would spend one more week in Nepal before flying to Bangkok and reuniting again with what was left of the Spicyroad team. All in all, Nepal didn’t feel that much like a new country to us due to the similarities in food, the culture and even the name of the currency, after coming from India. It often felt to us like a more mountainous and calmer India. But being so close to the huge Himalayan ranges and seeing our first eight-thousander were amazing and breath-taking experiences. Hitchhiking became an adventure everytime during our time in Nepal, whether it meant being stuck in traffic jams for hours on a one-lane mountain highway or overtaking trucks in suicidal driving manoeuvres. And our meetings with NGOs in Kathmandu were quite shocking but very inspiring encounters for us.